Moira Buffini’s latest play Handbagged is both an hilarious comedy and a very different kind of history play. The play was such as success at the Tricycle Theatre last year that it has now transferred to the larger, more central Vaudeville Theatre. The story focusses on the weekly meetings that Margaret Thatcher had with Queen Elizabeth II throughout the eleven years she was prime minister. Since those meetings were private no one will ever know what was said. Buffini therefore draws comedy not just from the presumed clashes of personalities of the two top women of Great Britain but from the play’s own attempts to reconstruct their meetings. In Tom Stoppard’s 1974 comedy Travesties, Stoppard explores how history is distorted by memory when he has the Old Henry Carr, once a British consular official, reminisce in the present about his time in Zurich in 1917 when his younger self interacted with such notables as James Joyce, Tristan Tzara and Vladimir Lenin who were also living there. The flaws and repetitions of the Old Carr affect what we see the Younger Carr do on stage. Buffini decides to double the fun by presenting us with two versions of Thatcher and the Queen. The first set we encounter are the public figures as we best remember them – the Queen called “Q” (Marion Bailey) as she is now, and the late Thatcher called “T” (Stella Gonet) as she was after she lost power and before she was stricken with dementia. These two trade comments as they watch their younger selves known as “Liz” (Lucy Robinson) and “Mags” (Fenella Woolgar) interact. This clever device allows Q and T to interact in their present while Liz and Mags interact, reflecting on what they see. The device also allows Q and Liz and T and Mags to interact, the younger selves complaining to the older selves about what is happening while the older selves sympathize or utter premonitions. 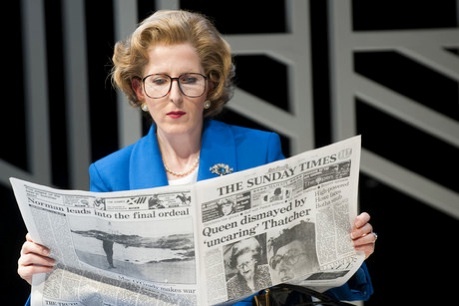 As if this doubling of major characters were not enough of a deconstruction of history, Buffini has two male actors play all the remaining roles – Jeff Rawle most notably as Denis Thatcher and Ronald Reagan and Neet Mohan most notably as Neil Kinnock and Nancy Reagan. Recognizing that the audience may not actually know the history being recreated on stage, Mohan, as the youngest of the cast, is frequently ordered by one of the Queens or Thatchers to fill in the “young people in the audience” about the events discussed. This strategy may seem amusing to most of the audience, but it does remind us that some signal events such as the Falklands War were 32 years ago. This is a highly unusual play about history since it derives so much of its humour from its metatheacricality. Since no one will ever know what went on at the weekly meetings between Queen and PM, Buffini continually underlines the fact that the meetings she depicts are inventions, ones that Q and T often object to with remarks like, “I may have thought that, but I never said it”. And, as Q says, “Whatever we say, must stay within these three walls”. Yet, in reconstructing these meetings, Buffini uses what we know of what the Queen and PM said in public to extrapolate what they may have said in private. In so doing, Buffini manages to inform as well as entertain. She has Liz and Mags deliver speeches that are part of the public record, and it was fascinating to see how some of Mags’ speeches were greeted with such enthusiastic applause. Buffini also features the infamous 1986 Sunday Times front page article from an unnamed source proclaiming “Queen dismayed by ‘uncaring’ Thatcher”. Buffini provides a remarkably evenhanded treatment of both powerful women. The Queen is not a pointless figurehead and the PM is not a “Hitlerina”, as she is called in Caryl Churchill’s Top Girls (1982). Buffini has Q tell T, “Meeting one’s PM is like meeting the other side of the coin. We are both Britain.” The PM represents change and politics; the Queen represents continuity and the values beyond politics. If the two women clash, it is because they have completely different duties and priorities. The Queen is head not just of Britain but of the whole Commonwealth and Head of the Church of England. Her reign has naturally given her a wider perspective of the world. When Mags talks of the miners’ strike of 1984-85, Liz asks her, “Have you ever been down a mine? I have.” When Mags speaks of the importance of the Falklands War without reference to the lives that may be lost, Liz reminds her that she has a son, Prince Andrew, fighting in that war. When Mags and Denis listen to one of Liz’s Christmas Day speeches about caring for the poor and downtrodden, Mags asks her husband, “Is Her Majesty a socialist?” while Liz says of Mags, “For a Methodist, she’s remarkably Unchristian”. The remarks neatly contrast the two women’s roles and the personalities molded by those roles. As for the PM, Buffini sees Thatcher in almost a tragic light, with the inflexibility and doctrinaire stance that brought her to power becoming exactly the factors that cause her to lose power. Buffini shows us someone so accustomed to fighting against enemies that she doesn’t realize the harm she does herself by looking for “enemies” within her own party. When a character remarks that Thatcher died of dementia, T corrects him saying, “One does not die of dementia. One lives with dementia”. “Dementia” is, in fact, the last word of the play and a clue that the point of a history play, even if it involves speculation, is to serve as a reminder of a past that still influences the present. The most enjoyable performances come from Bailey and Woolgar. Bailey, made up to look surprising like the present monarch, enhances this look by perfectly imitating the Queen’s typical gestures and postures. Bailey’s Q may seem grandmotherly and desirous of only a nice polite chat with her PM, but she also gives us a glimpse of her dry wit and her longer perspective of having seen so many PMs come and go with the times. Woolgar perfectly captures Thatcher’s habit of addressing people as if she were an extraordinarily patient schoolmarm trying to explain the obvious to an intransigent pupil. Woolgar shows how the measured pace of Mags’ speech and her dulcet tones somehow make her view that hers is the only view only more annoying. Mags’ smile may be meant to calm but it has the opposite effect. “She’s lecturing me again”, Liz exclaims. Stella Gonet and Lucy Robinson have less to do, although Gonet and Bailey have a memorable dispute about whether the play should have an intermission. Bailey, concerned about the public’s comfort, thinks they should have one, whereas Gonet imperially proclaims that once they’ve started they should play right through. Robinson has a fine moment of nonplussed reaction when Mags suggests she read economist Ferdinand Hayek. Rawle and Mohan are variable in their sixteen or so roles. Rawle’s Denis is quite good, but both their Reagans are caricatures and designer Richard Kent should at least give Mohan’s Nancy Reagan a wig to fit in with the over-hairsprayed dos of the four women. Mohan’s most important role is that of liaison with the “younger” audience which he fulfills with verve. Kent’s sent looks like an abstract sculpture, but eventually we see it is a deconstructed Union Jack. In that it is a perfect representation of the play that so playfully deconstructs itself while at the same time bringing to life the two most powerful British women of the 20th century. It is heartening to see that such an inventive, intelligent play should meet with such popular success. 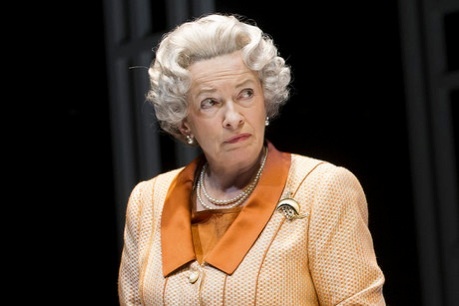 Addendum: Since this review was written, Handbagged has gone on to win the 2014 Olivier Award for outstanding Achievement in an Affiliate Theatre. Photo: (from top) Marion Bailey (Q), Lucy Robinson (Liz), Fenella Woolgar (Mags) and Stella Gonet (T); Fenella Woolgar as Mags; Marion Bailey as Q. ©2014 Tristram Kenton.